A new Indiana State University program is aimed at providing children and their families with the knowledge and skills to make wise financial decisions. University representatives joined Old National Bank officials Tuesday in announcing a financial literacy program to be based in the Scott College of Business at Federal Hall. "Old National Bank is excited to partner with Indiana State University, the Vigo County School Corporation and the Terre Haute Children's Museum to support this exciting financial health and empowerment project in the Wabash Valley area," said Bob Jones, president and CEO. "A focus of this project will be to create and identify initiatives and activities to help build financial capacity for individuals, families and businesses in this community." Dan Doan, region CEO with Old National, said an additional component of the financial empowerment project is to provide youth and young adults with the educational foundation and resources they need to achieve financial success. "With support from our dynamic collection of partners and ISU student teams, we will focus our resources on financial literacy activities and peer-to-peer coaching. We hope to enhance the quality of life for the students while also strengthening the community overall," Doan said. The Old National Bank Foundation has committed $250,000 in funding for the Old National Bank Financial Health Classroom and to support the Old National Bank Financial Literacy Program for the next five years. "Indiana State University is grateful for Old National Bank's support in addressing this important issue," said university President Dan Bradley. "Providing children with the skills and knowledge to make wise financial decisions will benefit them tremendously as they grow up and enter the workforce." Financial Health is an important concept for everyone - regardless of age, said Patty Butwin, a member of the Indiana State University Foundation and Children's Museum boards. "Whether we are just starting out and learning about the value of coins and what money buys or whether we are on Social Security and/or a pension or investments, we need to be smart about our money - how we make it and how we spend it," Butwin said. The partnership will incorporate and build upon initiatives already put in place by the Bayh College of Education and its Center for Math Education, including the "Go Figure" program, which partners with the Children's Museum to help youngsters develop math skills. Each semester in the "Go Figure" program, Indiana State students and faculty encourages children to get excited about math through fun topics such as elections, piloting and sports. 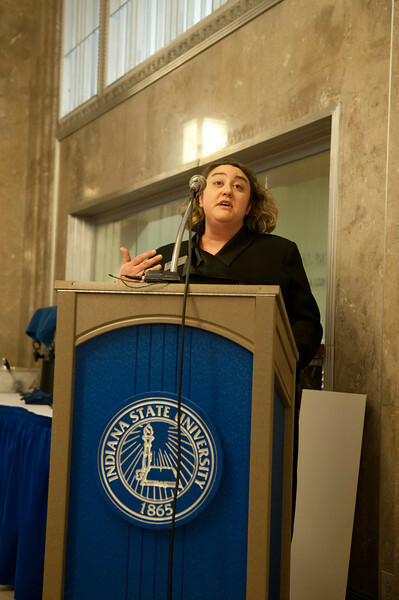 "This partnership provides wonderful opportunities for Indiana State University students to be further involved with the community. Not only will they be helping others, but also increasing their own financial literacy," said Jodi Frost, assistant professor of math and computer science and the project's coordinator. "As a mathematics educator, I am thrilled to be involved in a project that is focused on real world applications of mathematics." The program will involve the development of "age and life stage appropriate" financial education programs that can serve as building blocks for economic development in the Wabash Valley, said Butwin. 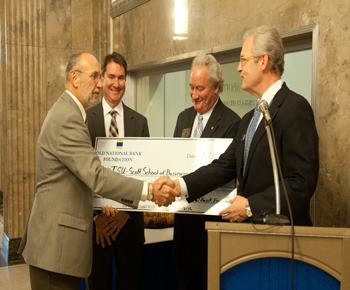 Old National Bank Foundation has provided $250,000 in funding for the Old National Bank Financial Health Classroom in Indiana State's Scott College of Business and for a new financial literacy program for K-12 students and their parents.